Continuous casting is a casting method used in high volume production of metals with a constant cross-section. The method uses an open ended graphite die which is surrounded by a copper jacket. Through which is poured molten metal. The graphite mold is typically water cooled. This allows the molten metal to solidify within the die, the custom solid metal form is then extracted from the mold and pulled/passed through rollers and water sprays. This process removes the heat from the metal, and gradually solidifies it. 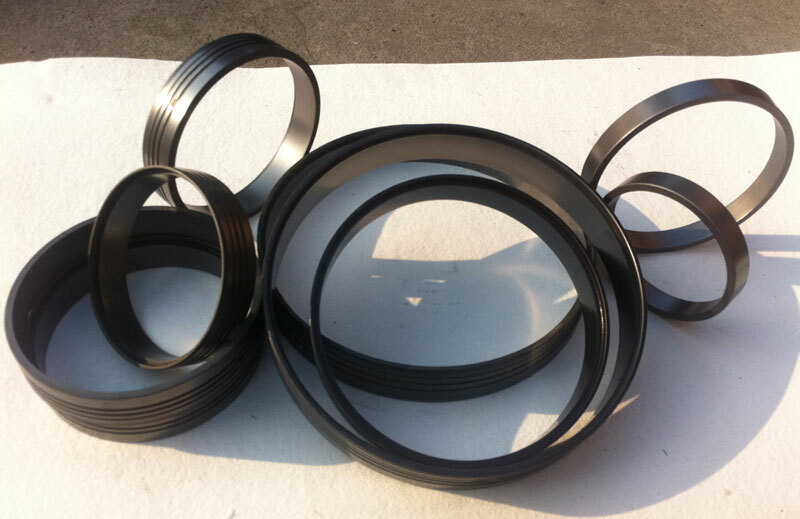 Graphite Ring is a widely used in continuous casting. The die molds are generally produced out of graphite. In these types of applications, the types of graphite used are ISO-Molded types. Small porosities and good machinability are required properties, and ISO-molded graphite has those. In rare instances, where large ingots are produced, extruded graphite is used. There are two types of continuous casting processes, a vertical casting and a horizontal casting. Graphite molds are used in both types of applications. A wide variety of alloys are fabricated using continuous casting in graphite molds. Gray cast irons, copper-nickel alloys, nickel silvers, aluminum bronzes or gold and silver alloys, are just some of the alloys being produced with graphite molds. The coefficient of thermal expansion is an important factor that determines why graphite is used as mold material. The casting mold is a medium with very un-uniform temperatures, from hot inside due to the molten material, to cold on the outside due to the cooling process applied to it. The low coefficient of thermal expansion that graphite exhibits, allows the mold to function without deforming or cracking. Another very important factor is self-lubrication..
Graphite is a solid lubricant that allows for low friction between the mold and the cast material. Subsequently graphite allows for smooth extraction of the casting. There are various factors determining the lifetime of the mold. From the composition of the casted materials, to the casting temperature, to the cooling rates, all affect the life of the graphite mold. In general, graphite molds can operate continuously in excess of 100 hours. Also, graphite molds can be re-machined to smooth surfaces and used again. The specific graphite grade used is also determined by a multitude of factors. The main factor is the composition of the alloy to be casted. For example, for a gray iron, or a high nickel alloy a graphite resistant to wear is required, while for brass a relative dense graphite with enough open porosity to allow zinc to evaporate, will be a better choice. Designing graphite molds for continuous casting requires taking in consideration all these factors and applying them to your specific application. Grade selection is of the most importance, and should include input from foundry men, graphite manufacturers, and machine shops specialized in machining graphite. Even then, when designing a new system, actual trials could be needed, before an actual graphite grade is selected. Attached is a video showing the precious metal strip casting process using an IRM caster fitted with Semco Carbon graphite components.